The VMM type valve is a combination of two valves in an only compact and versatile valve housing. 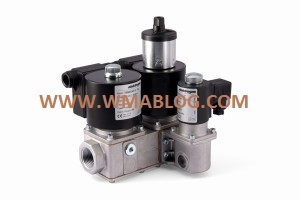 The first valve is a fast opening safety solenoid valve. The second valve may be a fast opening or a slow opening solenoid valve to adjust the gas flow, with a first adjustable fast stroke and a second adjustable slow stroke. It is possible connect a third by-pass valve, which performs by driver stage or to obtain a second fast (slow) stroke or both. This type of device is suitable for gas and air blocking and adjusting controls in atmospheric burners or fan-assisted burners (with one or two stages operation), in industrial kilns and in all gas equipments which use regulating trains.